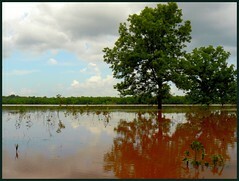 Dianne and I just got back from paddling at the White Oak Area of DFWR. We wanted to take the Heritage Angler Kayak out to test the patching job I put on it this afternoon. The kayak floated dry like it was brand new. I could not be happier! It took longer for the folks at Baker Electric to fill out the paperwork to rent me a heat gun than the entire repair job. The plastic welding material that Becky sent me melted and fused with the boat hull very quickly. I thought it might change color after melting but it did not. The patch matches the boat wonderfully. I even filled a couple of minor scrapes in the hull because it was so quick and easy. If you don't know where to look, you can hardly even see the patches. Renting the heat gun only cost me $5, a fraction of what I would have paid for the two Heritage caps Becky sent me. I knew that our kayaks could be repaired, but I can't help being surprised at how easy it was. Honestly, I never repair things...I'm a software guy, but this was as easy as drying your hair.